Build connections with your visitors by letting them subscribe to marketing emails about your website. 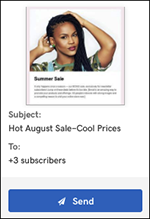 Then you can create sales alerts, promotional events or newsletters as part of an email marketing "campaign." And that increases your site's visitor traffic. Click Overview in the Marketing tab. 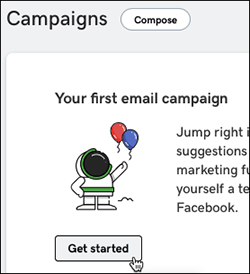 In the Overview window's Campaigns section, click Get started if this is the first campaign you've created. Otherwise click Compose. Note: If you have more than one email marketing account, you'll first be asked to choose one. 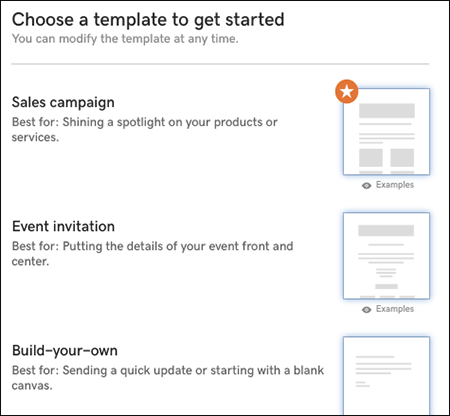 Select a template to get started. 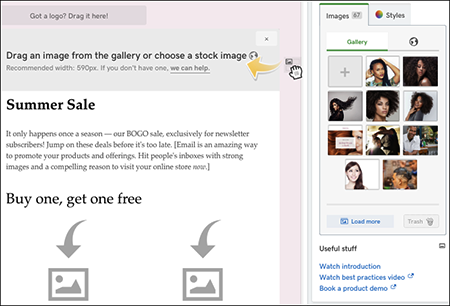 The right panel automatically displays images used on your site, which you can drag to the banner or body of your marketing email. Use the various toolbars to add elements such text, pictures, titles, and buttons. (For more details, see Create your first email campaign. When you're done creating your marketing email, click Continue. Use the Recipients tab to enter email addresses or a contact list and click Continue. Use the Details tab to add such items as the Subject, tracking options and social media, and click Send to email it immediately. Note: If you want to schedule the mailing for another time, click Send later and follow the prompts. To return to your website, click Edit/Edit Site.